You could call me a curator of hydrangeas. 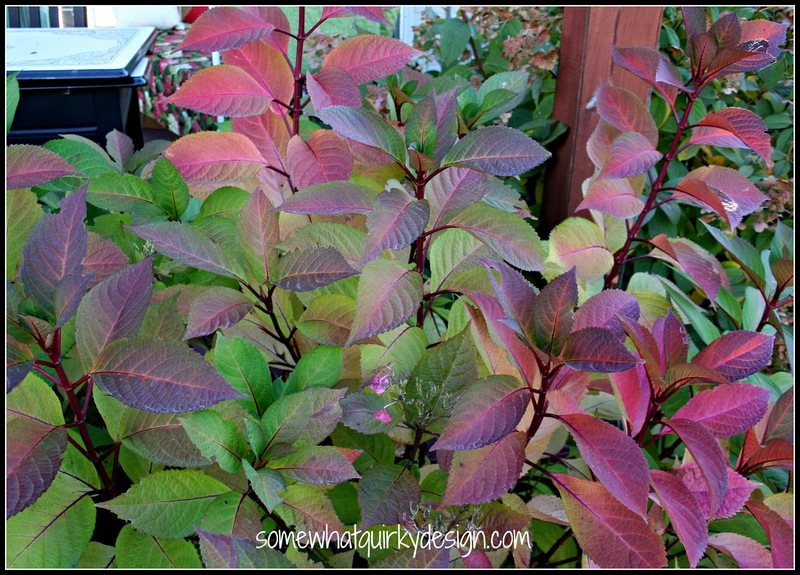 They are my favorite plant/bush to grow (except maybe for basil). I love the blooms. They look good in the spring, summer, and fall. The winter, well - not so much, but that gives me something to look forward to in the spring. 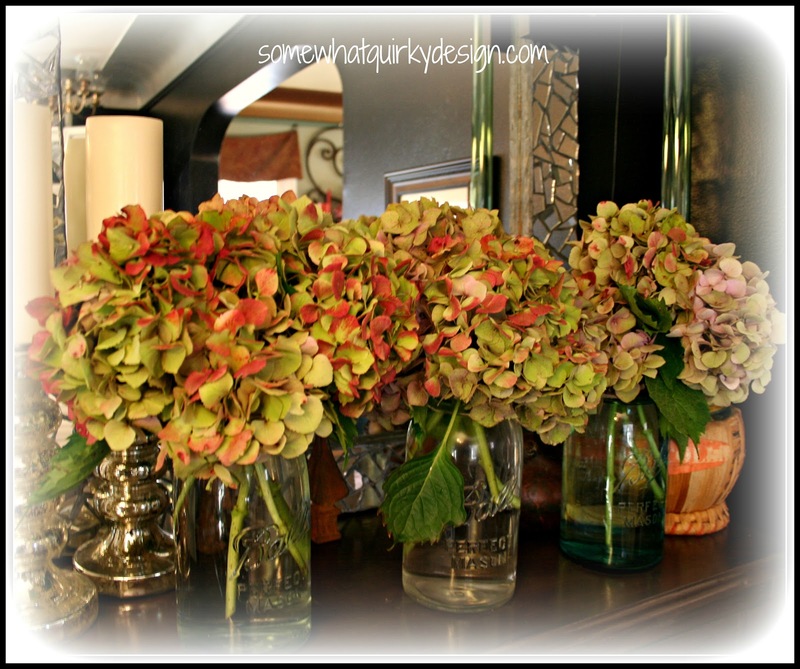 I have 9 hydrangeas - all different. Two of them are lace-caps that have a shorter blooming period. Neither one of them bloomed very well this year because they were the most effected by the late frost damage that we got this year. All but one of the others only bloomed about 50% of their normal blooming pattern. They did all return to full size by August, so I feel hopeful for next year. Because I had to wait awhile for them to recover from the frost damage, I left most of the blooms on the plants for the entire summer. So my chore this weekend was to cut off all of the blooms and get them ready to dry. At this time of year most blooms need to be cut off very close to the bloom so you won't damage the buds that are already set for next year. So these I cut off and hung them over a long piece of twine hanging off of my curtain rods. Sorry no pictures - I'm just not a good enough photographer to take a picture straight into a window. The two types that I could still cut with stems - Glowing Embers and Quick Fire - I put in water. I actually prefer drying the hydrangeas in water. I just put them in water and leave them in until they are dry. Sometimes the water evaporates, sometimes it does not. Sometimes they stay fresh for weeks before they dry. 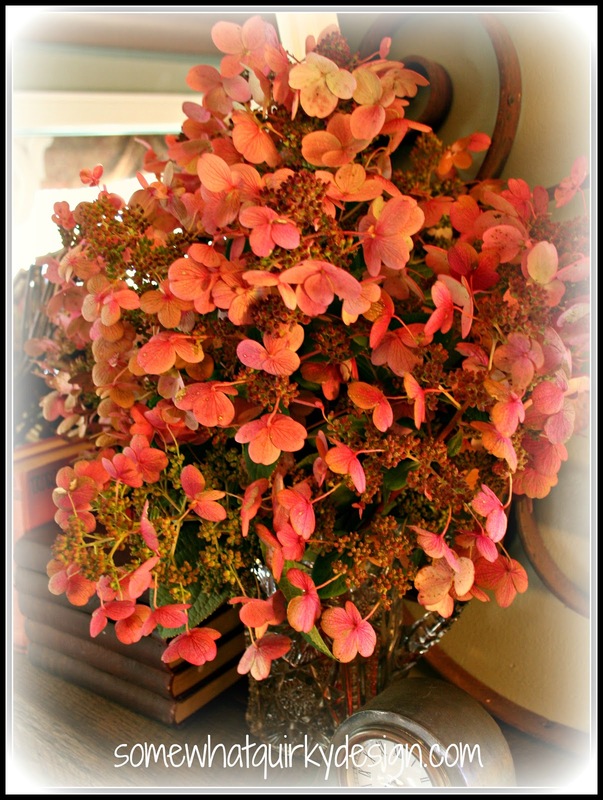 Note: above are the Quick Fire Hydrangeas. They bloom the earliest of all the plants I have. The blooms come in white and pink up over the rest of the summer. The deep color doesn't come until September or so. Above are the Glowing Embers. I use pictures of them all the time in my posts - fresh and dried. Both of these types dry perfectly every time. The other kinds are hit or miss. I like them to dry in color, rather than turn tan or brown. Most of these varieties turn darker and redder the longer they stay on the plant. When they have color in them they are more likely to dry into a color that I like. 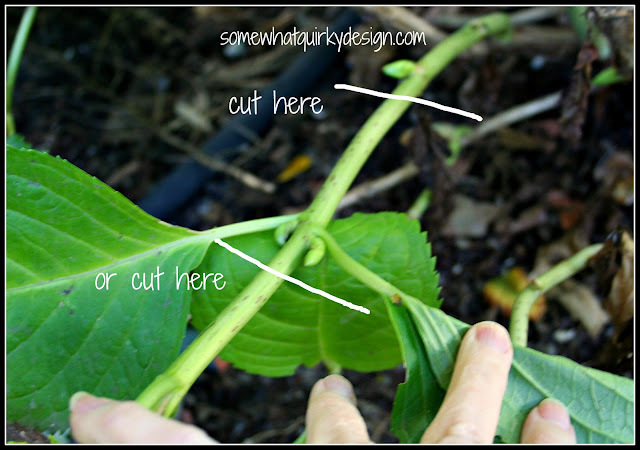 In case you were wondering - this is how I decide where to cut the stem when clipping. Look for the places where there are leaf buds and clip right above that. One of the lace-leaf types is called Lady in Red. It has reddish pink blossoms (that I don't have pictures of but you can see here), red stems and a nice red glow to the foliage. 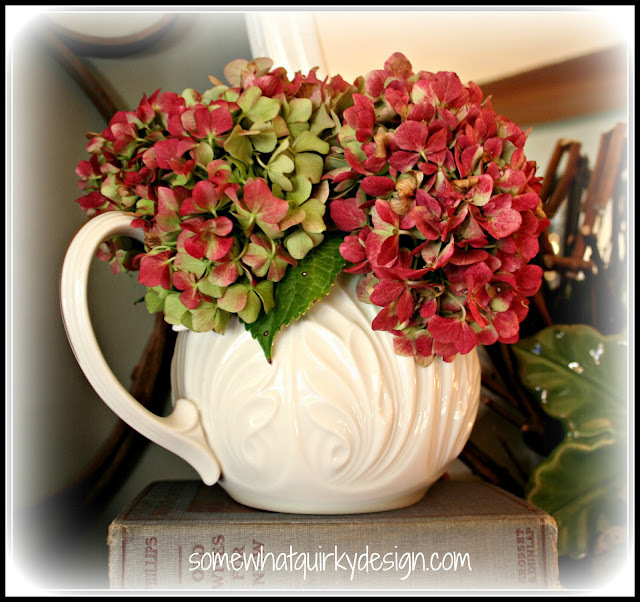 I know this has nothing to do with cutting hydrangea blossoms - I just liked this picture. 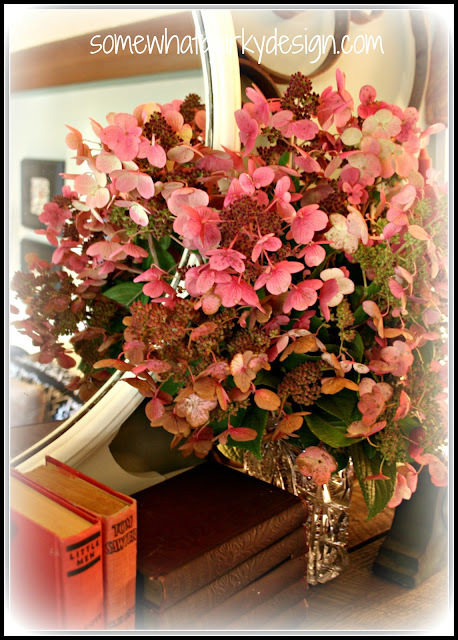 The rest of the pictures are purely gratuitous - because there's not much more beautiful than a picture of a hydrangea. Karen, your hydrangeas are just beautiful! I have several Annabelles myself, and really love them dried. Your directions for cutting them were spot on. 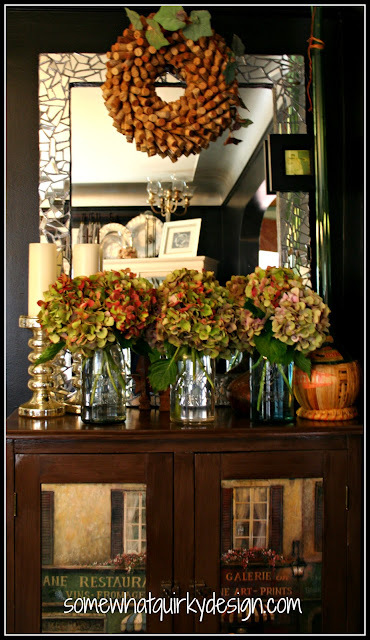 And I really love the cork wreath in the top photo! Did you do that? If so, do you mind commenting back with a link? I couldn't find a search button on your page. Thanks! These are so beautiful! My mom just gave me a huge bunch of them! 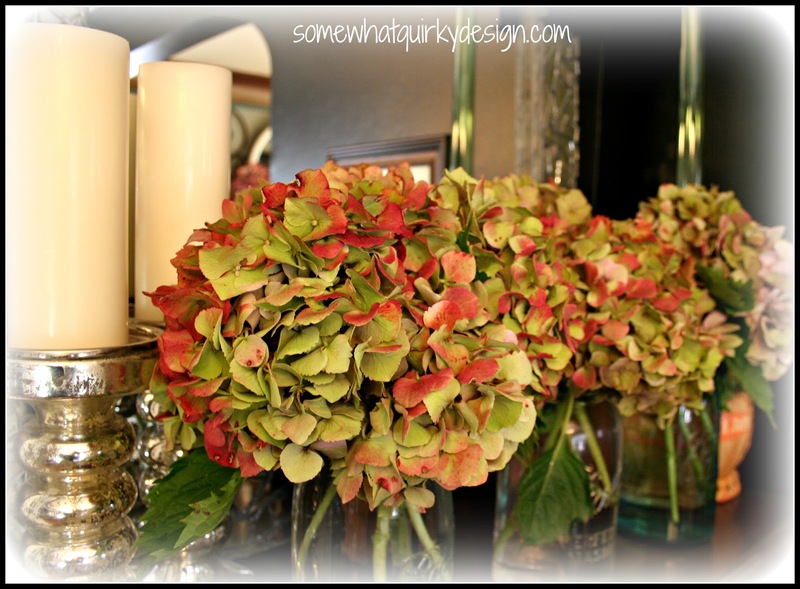 I posted it in my fall decorating post. Karen, I love your hydrangeas. I'm so jealous. Mine did not perform well this year at all. We had late heat and they just fried. Thanks for sharing yours with us. I will enjoy them vicariously. You are sooo good!!! 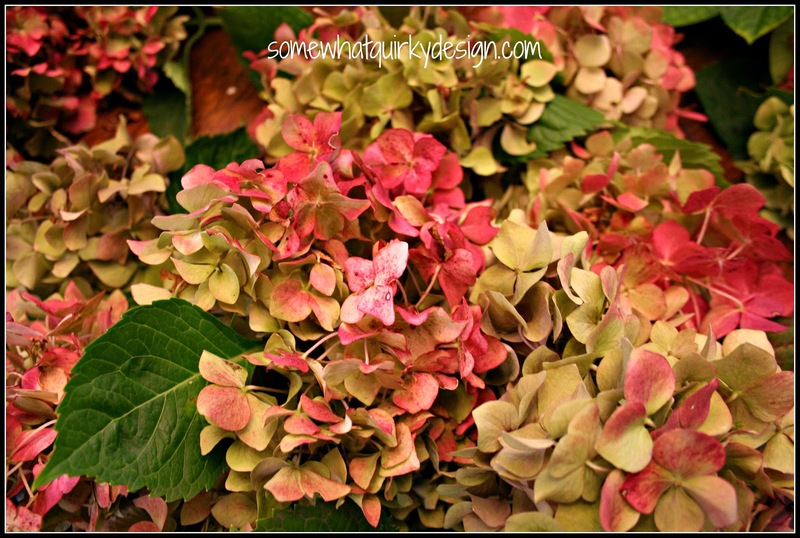 I need to get my hydrangeas to bloom!!! Thank you for the tips-I loved dried hydrangeas and its my first year growing my own! Here from Hometalk! 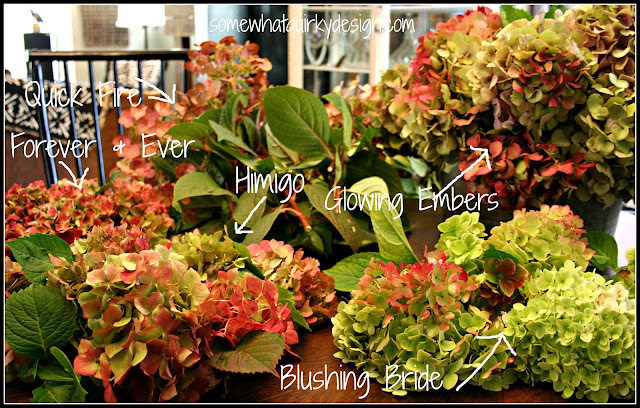 Oh, I wish I could go pick some hydrangeas! I am in love with hydrangeas. And yours are just perfect. I've been swooning!! The colors, the arrangements. Just perfect, really.